Statistical Computer Performance Evaluation contains the proceedings of a Conference on Statistical Computer Performance Evaluation held at Brown University in Providence, Rhode Island, on November 22-23, 1971, under the auspices of the Division of Applied Mathematics and the Center for Computer and Information Sciences. The papers review the application of quantitative, and particularly statistical, methods to the study of computer performance. 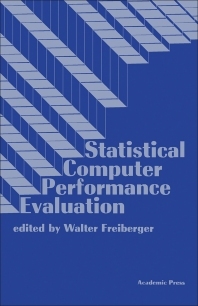 Comprised of 19 chapters, this book begins with an overview of the state of the art of computer system evaluation and some quantitative methods (analytical, simulation, and empirical methods) that are applicable to the problem. A utility theoretic approach to evaluation of a time-sharing system is then described, followed by a discussion on the results of a multi-factor paging experiment. Subsequent chapters focus on statistical quantification of instruction and operand traces; measurement and improvement of program behavior under paging systems; free-storage algorithms; and probabilistic models for predicting software reliability. This monograph will be of interest to practitioners in the fields ofcomputer science and applied mathematics.